Armagnac is frequently mistaken for its cousin Cognac created about 150km north of Bordeaux. It was easy for the Dutch and English to trade in Cognac as transportation of the ‘brandewijn’ or burnt wine / brandy used to fortify wine during transportation was easy via the Charentes River. However, further to the south, the landlocked AC of Armagnac was in a tough position and as such unable to capitalize on the slightly earthy, fuller spirit created in Gascony. What this meant was that Armagnac struggled to be noticed by the world and as time marched on, eventually the industry was hit hard by phylloxera, then prohibition and several world wars. Armagnac distillers didn’t change the Alembic Armagnacais single column still they used to produce the spirit in either – originally with about 3 plates, today’s versions have only 15-20. This means Armagnac is fruitier, deeper and richer than the average Cognac as it’s only distilled once and with secondes (the tails of the distillation process). There are only about 18,000 hl of Armagnac being produced today – just a fraction of what is made in Cognac. But with tastes changing to deeper and richer spirits around the world, Armagnac’s fortunes look ready to rise again. Armagnac is made from Baco 22A (a crossing of Folle Blanche and the hybrid Noah), Folle Blanche or Colombard in addition to 9 other possible white grapes in three Crus – the best being Bas Armagnac, Tenereze or the lesser Haut Armagnac. This Armagnac is clear and bright, light amber with significant legs. On the nose it’s clean and matured (as a VSOP it’s at least 4 years old by law, but as most are aged much longer, it’s probably between 10-15 years old). It has medium plus intense aromas of orange rind, sweet orange blossom, brown sugar and clover honey, patisserie, toffee, vanilla and caramel. Some baking spice accompanies the oak and a sandalwood perfume. On the palate, it’s dry and has smooth alcohol with some initial heat but marvellous integration and complexity. It has medium plus body with pronounced flavour intensity similar to the nose with mandarin orange, citric zest, fig, oak, vanilla, caramel, clove and cinnamon. It has a long finish with complexity. Beautifully balanced and with the long finish and intense flavour spectrum, it’s an outstanding spirit. This entry was posted in Armagnac, France. Bookmark the permalink. Hello Walter! Who is the produce of your bottle? 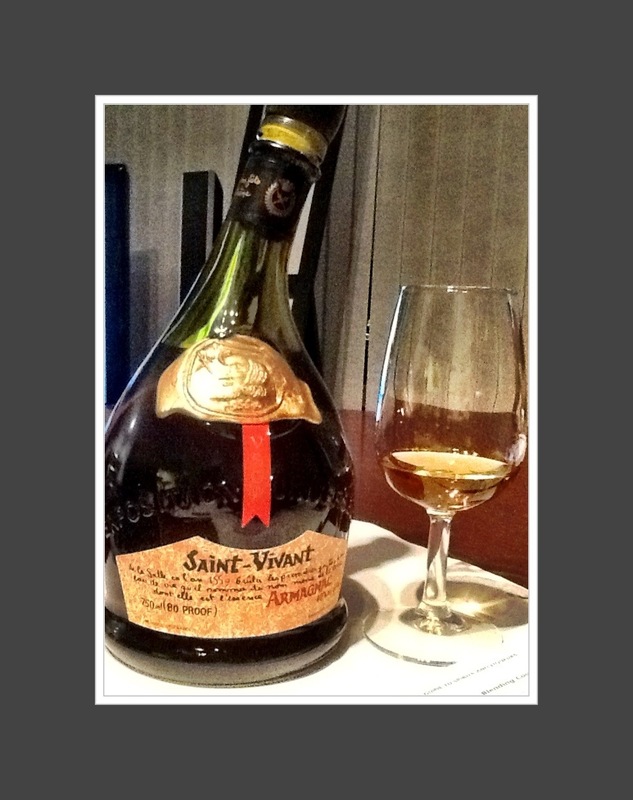 Is it Saint Vivant? That sounds very exciting…let me know! Don’t need another bottle of this, but thanks! Have fun and enjoy! beeniez@sympatico.ca if you have information.